The Cave of Swallows (Spanish: Sótano de las Golondrinas) is so deep that the New York Chrysler Building could fit inside it. The longest free fall in the world can be achieved there (there are even deeper cave shafts elsewhere, but none of them are so wide and straight). On this day in 1966, the deepest cave shaft in the world was discovered in the Mexican mountains. Specifically, it is located in a rocky are about half-way between San Luis Potosi and the port of Tampico on the coast of the Gulf of Mexico. The cave shaft is called the Cave of Swallows (Spanish: Sótano de las Golondrinas), and is around 370 meters deep. Its shape roughly resembles a bottle, having a wide bottom and narrower “neck”. The bottom of the cave covers an area of roughly 303 x 135 meters, while the cave mouth is shaped like a circle, roughly 55 meters in diameter. The Cave of Swallows is so deep that the New York Chrysler Building could fit inside it. The longest free fall in the world can be achieved there (there are even deeper cave shafts elsewhere, but none of them are so wide and straight). Amazingly, the cave mouth is wide enough to allow balloons with human crews to pass through it. 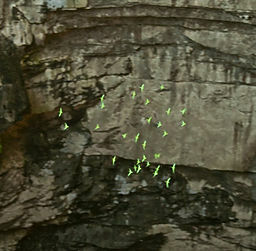 It was a popular base-jumping destination, but in more recent times there have been restrictions on the number of tourists allowed to visit it, in order to protect the local bird population from which the cave got its name.